Indian mathematician who displayed a natural ability in mathematics at an early age. His talent was recognized by G. N. Hardy, who arranged for him to be a student at Cambridge University. In the following few years, before an early death at age 32, Ramanujan produced an exceptional output in mathematical analysis, number theory, infinite series and continued fractions. Was it tuberculosis or something else that could have been cured? The articles written about the mathematical genius Srinivasa Ramanujan typically conclude, appropriately, about the sadness that such a gifted person should have died at such a young age, and attribute that to the debilitating illness of tuberculosis. Yet there may be more of a mystery about Ramanujan's death than is revealed by such a terse statement. At least, that is the opinion of D.A.B. Young, who published a detailed analysis of his review into what remains now known about the symptoms and treatment that Ramanujan received. This article appeared in the January 1994 issue of the journal Notes and Records of the Royal Society of London. Srinivasa Ramanujan in his homeland of India is revered as a genius much as Albert Einstein is so recognized in Europe and America. Each in their early lives worked as a clerk, and at first, each developed their prodigious insights without inspiration from scientific journals or academic colleagues. Their biographies are so widely available, however, no further description is necessary here, except to reference them on a timeline. Einstein's second paper that proposed what is now know as his special theory of relativity was published in 1905. It was in 1913 that that a letter from 25-year-old Ramanujan containing mathematical formulae was scrutinized by renowned Cambridge mathematicians G.H. Hardy and J.E. Littlewood, which led to Ramanujan's award of a research studentship at Trinity College in April 1914. Within four months of his arrival in England, the outbreak of the World War affected not only the contact with continental mathematicians, but significantly also created food shortages. As a Brahmin Hindu, Ramanujan compromised certain religious principles when he crossed the seas from his homeland of India to travel to Cambridge in England. Yet he remained a rigid follower in observation of dietary strictures. Young, the journal article author, with this point begins to set the stage for the mystery of Ramanujan's illness. The war had deprived him of full access to customary Indian comestibles to adequately meet his customary vegetarian food intake. This was made worse by self-catering his food needs only erratically while following his research obsessively: he could work continually for 30 hours and sleep for 20 hours. Young quotes Alice Neville's recollection that Ramanujan existed “cooking only once a day or two.” From this, Young proposes that without a healthy daily routine, Ramanujan likely suffered malnutrition. After three remarkably productive years of collaboration, Hardy's writings record by “spring of 1917 Ramanujan first appeared to be unwell. He went into a Nursing Home at Cambridge in the early summer, and was never out of bed for any length of time again.” Even with further time in sanatoria at Wells, Matlock, and with specialist care in London, it took until autumn 1918 before he showed noticeable improvement. When his condition seemed sufficiently stable, a return to India's familiar climate seemed advisable. The war was over, and in early 1919 Ramanujan was able to commence a voyage home, but suffered a relapse even by the time he arrived in Bombay on 27 March 1919. Contrary to hopes, in his native land, his health still relentlessly declined and he survived only to 26 April 1920 before death claimed him. Although no official medical records remain in England to retrospectively definitively diagnose Ramanujan's disease, there are some written accounts which raise questions concerning the validity of attributing death to simply tuberculosis. Before his illness became a cause for concern, Ramnaujan had a stout build, but he subsequently lost so much weight as to shock a visitor who compared his condition since 1914 with June 1918 and noted he had become weak and emaciated. Even the later passport photo taken in February 1919 for his trip back to India showed Ramanujan wearing his clothes still looking large on him. A lasting diagnosis of tuberculosis was made by Dr P. Chandrasekhar of the Madras Medical College, who was the attending physician from September 1919 until Ramanujan died on 26 April 1920. However, during the time in England, various doctors had drawn differing conclusions from their own observations and inferences from his medical history during the period before Ramanujan's return to India. They all likely were neither able to correctly identify the malady causing Ramanujan's suffering, but notably while considering other causes, nor were they convinced that it was tuberculosis. In his article, Young lays out interpretations for blood poisoning as needing consideration in the light of available clinical details. He describes several relevant diagnoses in medical terms the lay reader would find difficult, but one by one sets them aside based on certain contraindications. It is hepatic amoebiasis that remains highly suspect as the true cause of Ramanujan's death. Amoebiasis is a protozoal infection of the large intestine. In 1906, Ramanujan had a bad bout of dysentery, quite possibly amoebic dysentery, while growing up in India. It may have been a precursor for amoebiasis, which without adequate treatment, is a permanent infection. When, again in India, in 1909, Ramanujan exhibited further disturbing illness, it was followed by further medical problems and an excision of a lesion that can be explained in terms of consequences of the spread of amoebae within the body. Even what is known of Ramanujan's acute illness in England in the spring of 1917, the suspicion of gastric ulcer at the time could in hindsight be due to symptoms caused by a recurrence of intestinal amoebiasis. Further, Young cites another notable consequence since “chronic amoebiasis is an illness that upsets mental equilibrium and can give rise to depression,” and that was also indicated by the revelation that Ramnujan attempted suicide by jumping in front of a London Underground train from a station platform. He survived with only superficial leg wounds. The incident was hushed up since suicide at that time was a criminal offence. The documentation for this event is skimpy, and depends on the account of a story about it that Hardy gave at a dinner in 1936. Finally, there remains the lingering doubt—might Ramanujan have survived if correctly diagnosed and treated for hepatic amoebiasis? Thereby lies an imponderable. In 1918, hepatic amoebiasis was known as a tropical disease, “tropical liver abscess,” for which Young cites a medical text book of the time as stating it “presents a severe challenge to the diagnostic skills of the clinician,” However, the specialists treating Ramanujan in England had expertise in tuberculosis or gastric conditions. They likely had no knowledge of the pre-history of dysentery having little reason to ask such a question, while the patient himself may not have recollected such events as relevant. If, against the odds, the disease had been recognized, yes, there then existed treatments, by administering the drug emetine with aspiration of any detectable abscesses. A cure might have been effective event if attempted even as late as January 1920, according to Young's analysis. Young carefully footnotes his references, which together with the body of his article gives more detail than included here. Young also gives a more complete analysis of Ramnujan's suicide attempt as later described by Hardy. The full reference is given below, which is available through the online data services of any local public library that subscribes to JSTOR. Science Quotes by Srinivasa Ramanujan. 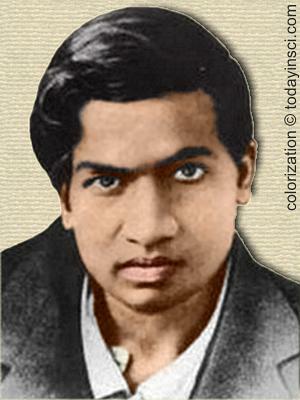 22 Dec - short biography, births, deaths and events on date of Ramanujan's birth. The Man Who Knew Infinity, by Robert Kanigel. - book suggestion.